Building your own deck can be a lot of fun, but there are some times when it is great to have an extra hand. One time is when you are putting down the decking and the boards are crowned or slightly warped. There's a perfect tool for every job and the same can be said when talking about deck construction. 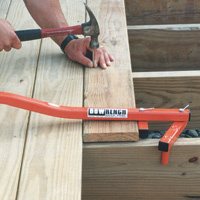 The is designed to help install new deck boards when you are replacing or building a deck. It first locks into place on the joist and then, by applying leverage, forces the board into place. You are then free to use both hands to hammer or screw the board. When working on alone or on a large deck, the Bowrench can certainly save you time and frustration.